In the 19th century, Dr. James W. Dale, a Presbyterian minister, embarked on a scholarly project that proved to be the most exhaustive study ever undertaken on the word "baptism." Aiming at a contextual understanding of the word, Dr. Dale meticulously examined its use in a wide range of historical documents, and his analysis is a masterpiece of lexicographical scholarship. Dr. Dale published his findings in four volumes, and for the first time in many years all four of these distinguished texts are available, offering a valuable resource for students and scholars of language, religion, and history. 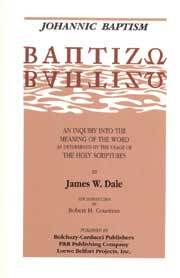 In this volume, Dale concentrates on John the Baptist's mode of baptism.